I have to say, Google Maps is awfully convenient! By the time we get to each city, I feel like I've been there before. I look for keywords like "WalMart, bookstore, bakery, museum", and make a route between all the general places I want to visit. Then I zoom as far as possible without going to street level and look for other areas of interest near my route. Then I take note of cross streets and landmarks. So by the time I'm walking around it's usually very easy to find what I'm looking for! 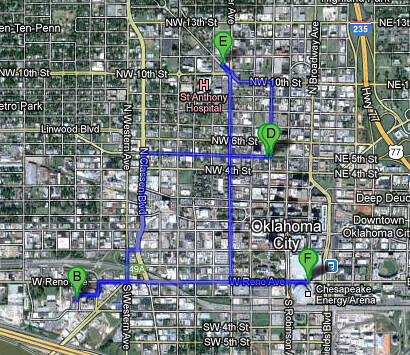 Once at the arena, I walked away from Bricktown (the downtown area) even though it looks like nothing's in that direction. But there is! There's a botanical garden and an antique market. The antique market was AWESOME. The items weren't at the Antiques Roadshow level of value; they had mostly nostalgia items and curiosities...stuff that can keep me occupied for HOURS haha. 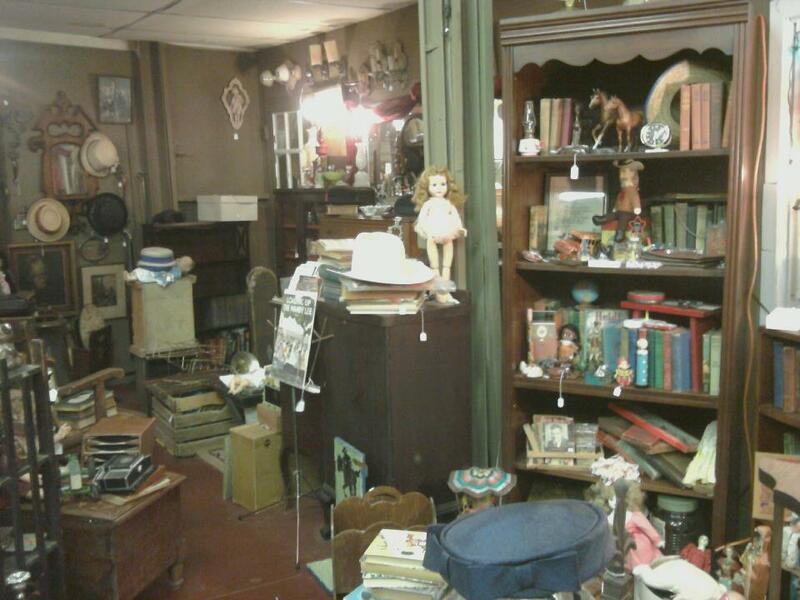 There was lots of military memorabilia, vintage children's books and toys, old cameras, glassware, etc. I spent probably 2-3 hours there just looking at everything, and bought some WWII-era National Geographics and a little something for my sister too. The Nat'Geos are neat...they all say "Buy US Victory Savings Bonds And Stamps" on the cover. The advertisements inside really astounded me. They're for typical stuff -pens, cars, vacuums, etc.- but they urge customers to place a "reservation order" on their product rather than buying them outright. "Our first obligation is equipment vital to victory," they say, or "Why not wait for it? You'll be glad you did. Buy more bonds today". Do you think any retail company today would do this for our country? After the market I wandered over to a greek restaurant across the street. It was definitely a local hang...I got pelted with questions right away. "What brings you here?" and "Where'd you get them magazines?". The servers were very nice and the food was good, made by the owner, an actual Greek chef. I forgot to mention, it was very very hot outside! About 102 degrees. I hung around the restaurant and enjoyed the AC for as long as possible, and drank lots of water, and headed back out into the heat. 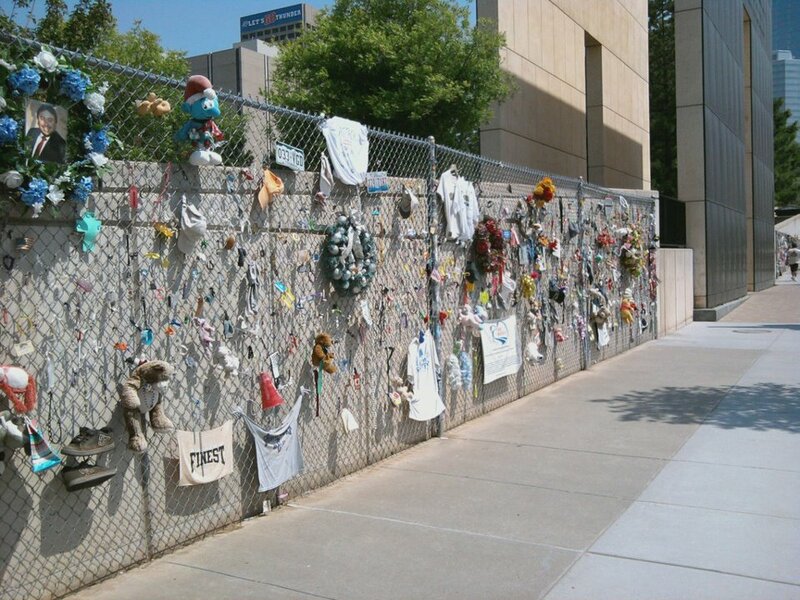 I skipped the botanical garden in favor of the OKC Memorial and Museum. I ended up not going into the museum. 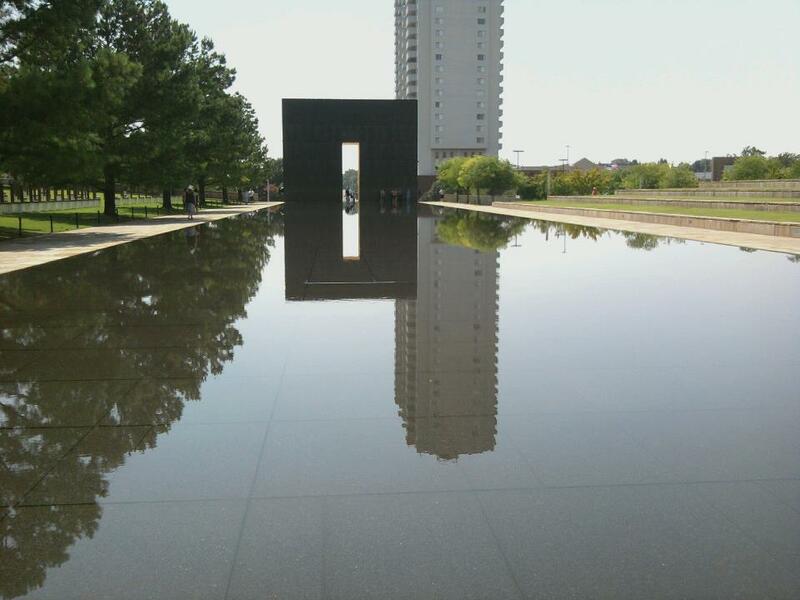 The memorial is very impressive and very sad. After that I walked further up Broadway and deeper into the city. There are lots of nice little restaurants and shops. 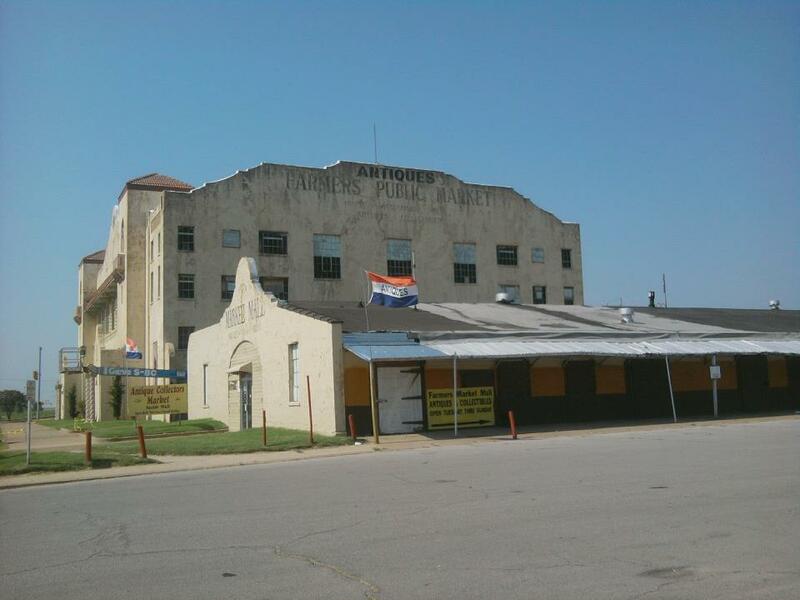 It looks like they're trying to revitalize the downtown and attract tourism, but the idea of OK City as a destination apparently hasn't picked up yet and many areas are still under construction. It was a strange atmosphere...comparable to a beach town in the off season. There are lots of people walking around, but they're locals who pretty much ignore the stuff intended for tourists. It made me feel like I was wearing a sign that said "Ain't from here" as I took pictures and stopped to read historical markers. 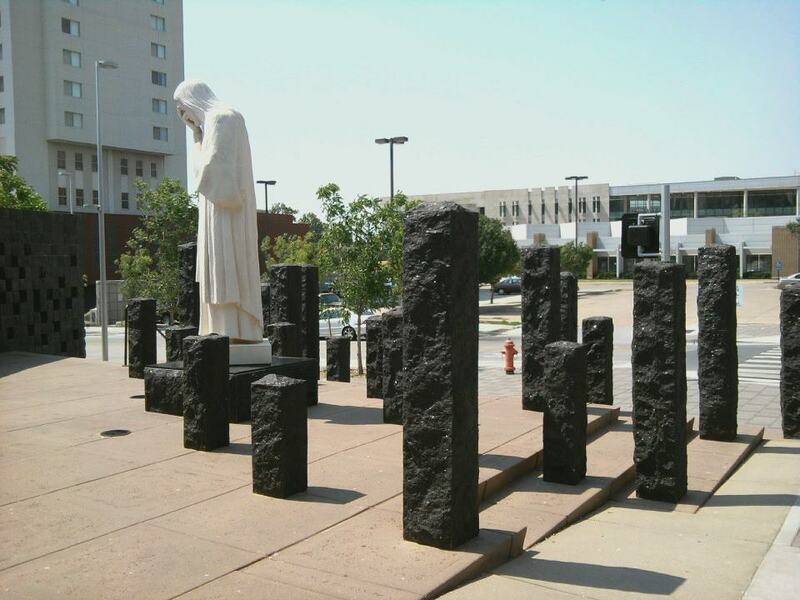 There are a lot of sculptures and street art in Bricktown, but most of it is so new. I hope OK City is able to attract tourists after everything's in place! It's a beautiful city, and people are friendly. I spent most of the day just exploring the shops and people-watching.